FREE Colgate Total Mouthwash at Target – Print Coupons Now! HURRY! FREE 8×10 Photo Print at Walgreens + FREE Pickup ($4 Value) – LAST Day! Tees, Tanks & Shorts for the Family Starting at JUST $3 at Target.com – TODAY Only! Keurig K-Classic From $62 (Regularly $150) + FREE Shipping at Kohl’s – Today Only! $10 Off $50 OR $25 Off $100 Toys Purchase at Target + Stackable Cartwheel Offers! 5 FREE The Good Crisp Company Crisps + 85¢ Moneymaker at Walmart – Print Coupon! March 18, 2019 at 8:12 pm PDT May contain affiliate links. Read disclosure. (Sale ends March 23rd) Hurry over to Target where they are offering a FREE $5 Gift Card with purchase of $20 Beauty & Personal Care products. This is an in-ad coupon, or you can find it in Target app under wallet. As an idea, get four Colgate Total Mouthwash and two Wet’n Wild Eye Cosmetics. 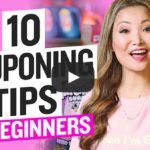 Then, use four $2 off one Colgate Mouthwash and $1 off one Wet n Wild Eye Products coupons from 3/10 SmartSource insert and submit for four $2 off one Colgate Total Mouthwash Ibotta Cash Back. After coupons, gift card & cash back, you’ll get all these products for FREE! Sweet! *HOT* Suave Hair Care JUST 50¢ at CVS (Regularly $4.29) – Today Only!